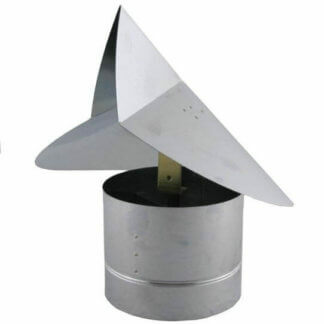 The FAMCO wind directional chimney cap is specially designed to rotate and align with the wind direction. It can be ordered with or without an adapter. 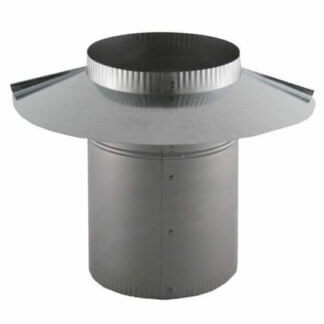 The directional chimney cap is designed to promote updraft while at the same time to prevent any downdraft. For those home owners that have the luxury of owning a home with a fireplace or some form of a chimney needed appliance understand the importance of protecting their home from poor air flow. A wind directional chimney caps prevents backdraft from occurring. Backdraft can be hazardous to one’s health. The pollution and allergens that are on the outside of the home can be pulled down into the home quickly filtering throughout making those living in the home miserable and uncomfortable. The WCASS Wind Cap Adapter will allow the wind directional chimney caps or just about any other round chimney caps to mount on a double or triple wall pipe, which will give you more options. The wind cap adapter comes in various diameters ranging from 5 inch to 14 inch all with a height of 9 inch. A wind directional chimney cap is able to assist in preventing such things as backdrafts while also alleviating pent up heat. A wind directional chimney cap can prevent outside forces such as rain, ice, debris and rodents from making their way down into the flu causing damage to the chimney walls. Homeowners that live in windy climates might particularly be interested in the purchase of a wind directional cap thanks to all their many benefits. Wind directional caps are made from a durable material that can withstand strong winds. Fireplaces are meant to be used and enjoyed however with them comes responsibility and upkeep. In order to insure safety while usage have chimney caps checked and replaced on a regular basis in order to prevent uncomfortable backdrafts and dangerous hazards from occurring. For more information on Wind directional chimney caps check out the professionals at FAMCO. The FAMCO family has the knowledge and experience to answer all your ventilation needs.